The Beauty of Life: Bright Eyes: Thanks to Two Miracle Products! Bright Eyes: Thanks to Two Miracle Products! I have unfortunately been "blessed" with dark under-eye circles. When I wake up in the morning, I look as though I've been out partying for six nights straight with a consecutive amount of three hours of sleep -- and that's when I've slept for eight hours a night! It only gets worse throughout the day ... by the time I head to bed around 11 or 12, I seriously have such dark circles that it looks like I got punched in the face and have not one, but two black eyes. I only wish I were exaggerating. But thanks to the two miracle-workers below, my eyes have almost returned to normal! (And hey, the rest is what concealer is for.) Check out the two eye creams this beauty chick just simply cannot live without. Want to minimize fine lines and wrinkles, all while defending your skin from free radical damage? Kiehl's Abyssine Eye Cream+ is the way to go. When I first opened up the jar, I have to admit I was skeptical. Could this cream really deter the look of aging while soothing my skin and making me look less tired? But the luxe, light-as-air white cream really felt amazing going on -- it's cool to the touch, and just feels so rich as it's spread on the skin. There's a light, almost buttery scent that just sinks right into the skin along with the formula, which absorbs within 10 seconds and leaves the skin feeling soft, smooth and not at all greasy. The main ingredients -- apricot kernel oil (has a high Vitamin E content to moisten and soften the skin while retaining its suppleness), corallina extract (a mineral-rich red alga that thickens and reinforces the skin's moisture barrier) and of course abyssine 657 (to soothe and protect skin) really just make skin feel incredible. Within two weeks, lines and darkness under my eyes had all but disappeared, leaving me looking healthier, more rested, and definitely happier! 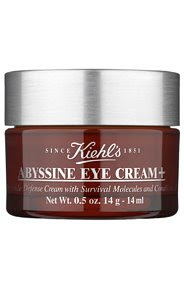 Kiehl's Abyssine Eye Cream+ retails for $37 at kiehls.com. 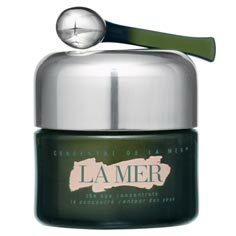 Unless you live under a rock, chances are you've heard of La Mer. The cult favorite (it's rumored that Jennifer Lopez uses best-seller Creme de la Mer not just on her face but all over her body) has been churning out some of the most sought-after products in skincare for decades. But their most recent addition to the family is this beauty chick's absolute favorite. The Eye Concentrate is formulated with not one, not two, but three forms of La Mer's patented Miracle Broth -- the original, a concentrated form and a new, encapsulated form to optimize continuous release to the skin. Designed to reduce the appearance of dark circles, puffiness, lines and wrinkles, the miniature tub packs quite a punch with the light cucumbery scent that wafts out as you unscrew the cap. As I dabbed it on under my eyes, it felt cool to the touch and left a slight sheen over the skin. In addition to the Miracle Broth, this cream contains hematite -- a naturally magnetic mineral that's known for its energies. The tub even comes with a specially engineered silver-tipped applicator that's just oh-so-chic. Within days of usage, my dark circles had basically disappeared, unbelievably staying far away even late into the evening hours! La Mer The Eye Concentrate retails for $180 at blissworld.com. hi! thanks for the great recommendation for dark circle-ridding. i was wondering though, did you use both of these creams at the same time? thanks for letting me know. I actually used them each for a month, and I saw great results with them both! I highly recommend either or both! great thanks so much. when i read your post the other day, i thought it was saying to use both, so i went out and got 1 of each! ;) i only started the la mer though, so i may return the kiehl's. i already notice an improvement just from applying it last night and this morning. vive la mer!